You may notice more electric vehicles on Canberra’s roads now that the ACT Electric Vehicle Council receives a new Mitsubishi i-MiEV courtesy of the Rock Development Group. 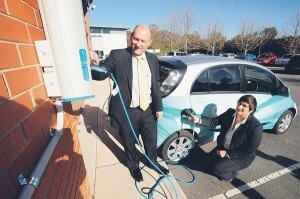 The vehicle will be used to promote the technology throughout Canberra. Both organisations are passionate about electric vehicle technology and are looking forward to their widespread adoption in the ACT. The average daily commute for a car in the ACT is just 37 kilometres, which is much less than the 160 kilometre range of an electric vehicle. On top of that, the majority of vehicles lay dormant for the majority of the business day – providing plenty of time to recharge. Electric Vehicles produce no CO2 emissions while operating and will source 100% of its energy requirements from renewable sources. Rock Development Group, one of just 40 organisations to make up the inaugural Mitsubishi i-MiEV Foundation Membership Group, received three of the electric vehicles. Director at Rock Development Group, Maria Efkarpidis said the Group is pleased to donate one of their fleet to the ACT Electric Vehicle Council. “We’re happy to be working with the Electric Vehicle Council to help make electric vehicles more accessible to Canberrans. They are a great technology and the more people who see and hear about them the better. “Electric Vehicle infrastructure will form an integral part of what we are trying to achieve at loop, the sustainable urban renewal project surrounding the Belconnen Fresh Food Markets. We will have electric vehicle charge spots throughout the precinct,” Ms Efkarpidis said. Chairman of the ACT Electric Vehicle Council, Ivan Slavich said he is excited to announce the deal with the Rock Development Group. “In a world where the future of the planets depends on sustainable transport, Electric Vehicles are seen as the mode of transport of choice due to their ability to run on renewable energy. "The vehicle will be displayed across the ACT and region. It will be showcased at the Thirda Canberra International Electric Vehicle Festival, held on the lawns of Old Parliament House on Sunday 25 September" Mr Slavich said.